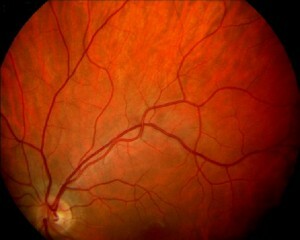 The retina is made of many layers of cells. Retinitis pigmentosa and similar diseases are rare, and often run in families. 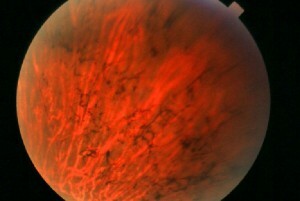 Patients with retinitis pigmentosa initially notice difficulty seeing in dim light. They then experience loss of peripheral vision. Photos comparing healthy, smooth retina pigmentation in a normal eye (top photo), versus the spikey black spicules seen in retinitis pigmentosa (bottom photo). While retinitis pigmentosa can not be cured, it can be slowed down. It also affects how other eye problems are managed, so proper diagnosis and expert care are important.